Los Angeles Ocularists | Ocular Prosthetics, Inc.
Ocular Prosthetics, Inc. is the largest and most experienced group of Board Certified Ocularists in California. With five office locations across the southern California region. However, our size isn’t what makes us true leaders in the design and fitting of prosthetic eyes for the most challenging cases. It is our combined experience of over 75 years, using the most advanced fabrication techniques, to deliver the highest quality prosthetic eyes possible. Ocular Prosthetics Inc. is equipped to provide exceptional service to our international base of patients across the greater Los Angeles area. 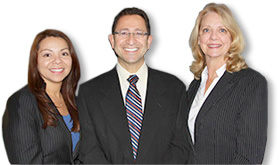 Our bi-lingual staff is available to accommodate Spanish speaking patients at all of our offices. Stephen Haddad’s vision for Ocular Prosthetics, Inc. is clear. To provide the most realistic, natural, and comfortable prosthetic eye one can obtain. At Ocular Prosthetics Inc, we work closely with your ophthalmologist and oculoplastic surgeon to create an ocular prosthesis that is as beautiful as it is comfortable. Many of our patients comment that they soon forget they are even wearing a prosthesis. Our “Team Assessment Approach” to fitting and fabricating an ocular prosthesis combines the input of our team of board certified ocularists to enhance the results for each prosthetic eye patient. We know how important and beneficial it is for our patients to receive this type of care. For more information on our unique team assesment approach, please read our blog post, “The Team Approach to Prosthetic Eye Care”, found under the Blog Tab. – Stephen Haddad B.C.O., B.A.D.O.